Yesterday in London while a million people joined the People’s March, there was another smaller march going on to raise awareness of endometriosis. 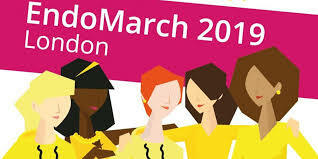 The aim of EndoMarch 2019 was to help to publicise tthe need for faster diagnosis, greater education and more funds for research into better treatments and an eventual cure. Marches in other cities and across the world will be taking place next weekend. There are around 1.5 million women living with endometriosis in the UK, and it can cause painful or heavy periods, exhaustion and bladder and bowel problems. Endometriosis doesn’t always affect fertility, but around half of women with endometriosis experience difficulty conceiving and it is a common cause of fertility problems. It’s a condition where cells which are similar to the womb lining are found in other parts of the body. Women with endometriosis are not always getting a diagnosis when they visit a doctor with symptoms, and research suggests that it takes on average seven to eight years to be diagnosed. During this time, women are often suffering in silence, uncertain of the cause of their problems. Endometriosis one of the subjects up for discussion at the Fertility Forum in London on March 30. Ertan Saridogan is a fertility expert with a special interest in endometriosis and he will be explaining how endometriosis affects your fertility. He will cover all the options for treatment and how to choose between them.